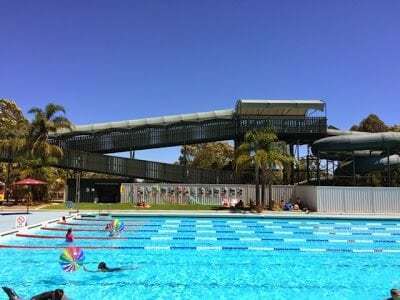 Here is a our list of the Best Water Slides in Perth – Perth has a great selection of waterslides at several different venues including theme parks, water parks, and leisure centres. 1. 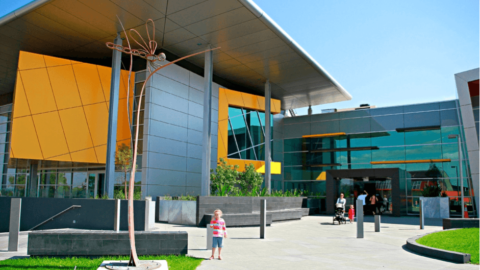 50-metrethrill slide at Cannington Leisureplex. 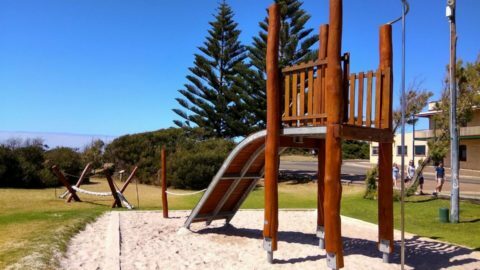 Location: Corner of Wharf and Seven Oaks St, Cannington. 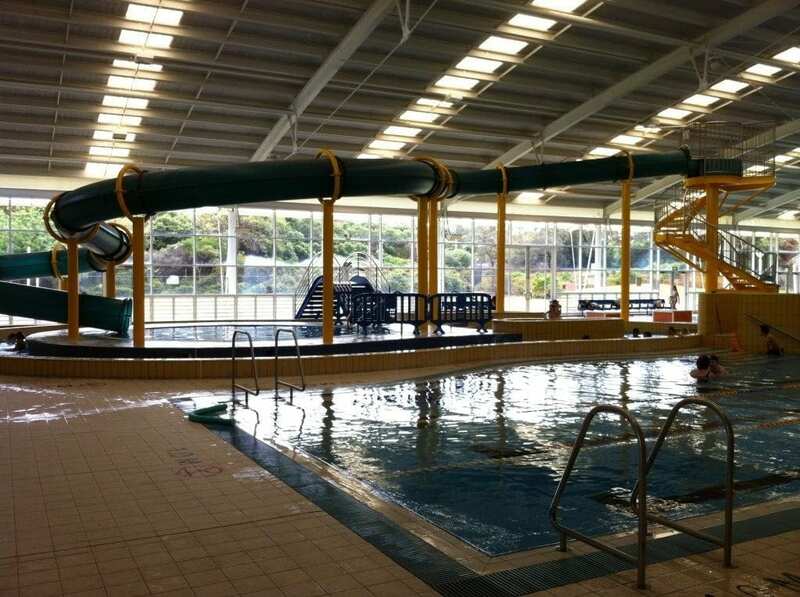 The water slide runs Saturday and Sundays 11am – 1pm and 1.30pm – 3.30pm and Fridays 4pm – 6pm. Hours vary during school holidays. 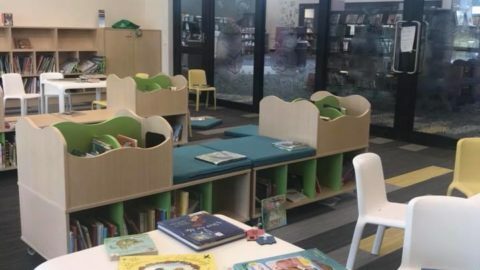 Children aged 6 and up only. .3. 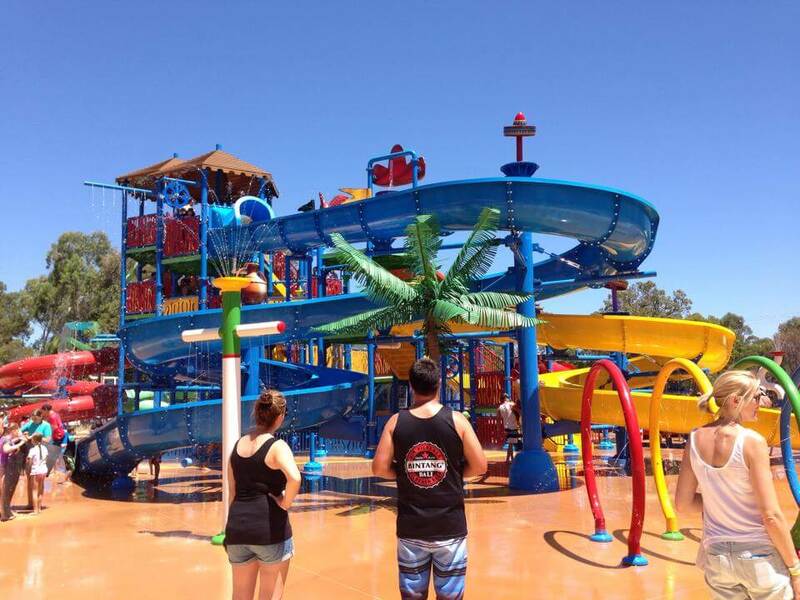 The Waterslides at Outback Splash at The Maze – Slides include a family slide, a side by side toddler slide and a brand new octopus themed slide. 4. 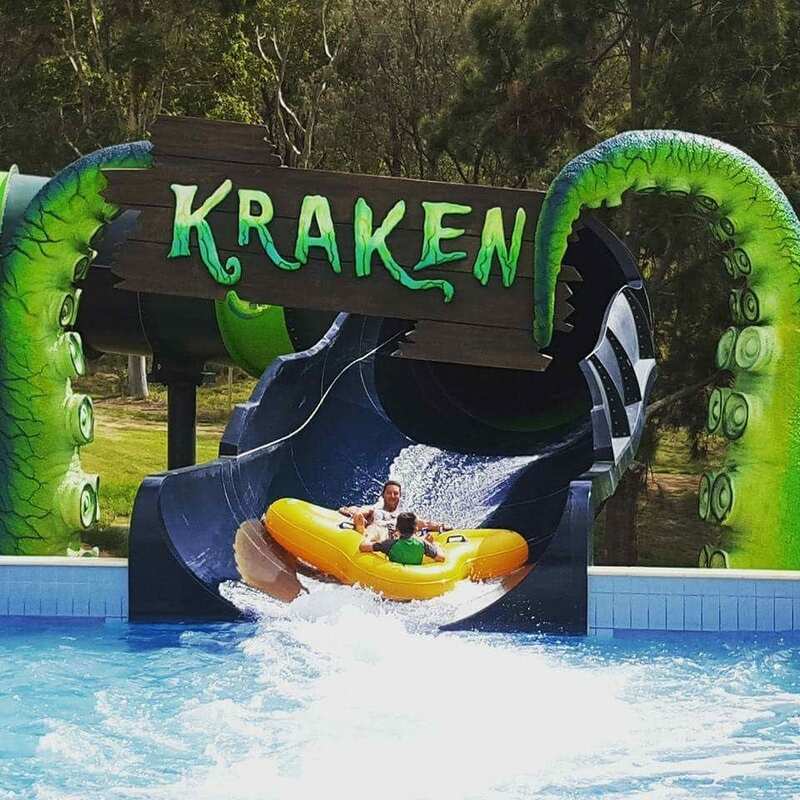 The Kraken – The enormous world record-breaking slide is like no other funnel slide ever built. 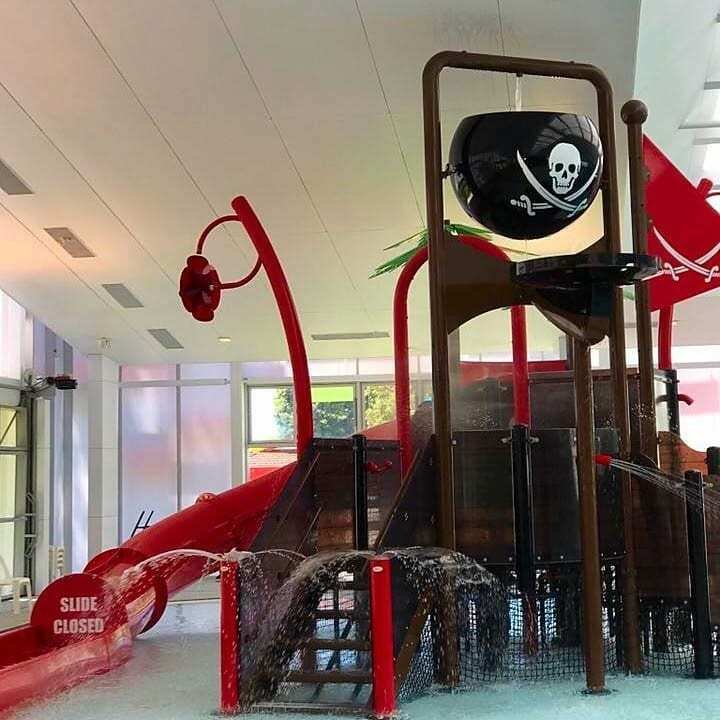 The four-person raft must first negotiate over 150 metres of dark twists and turns including a heart-pounding drop and a 360-degree twist before reaching the crescendo of the massive 60-foot funnel – which is about the height of a six-storey building. 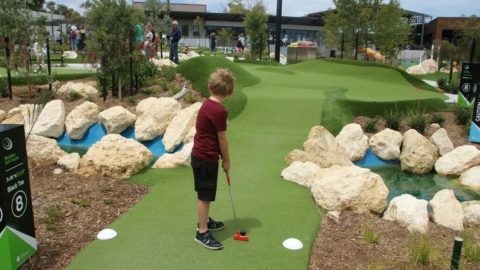 Location: Adventure World, Bibra Lake. 5. Rocky Mountain Rapids– ride down the mountain on your own tube as you navigate around the turns and through the rapids. Must be at least 110 cm to ride. 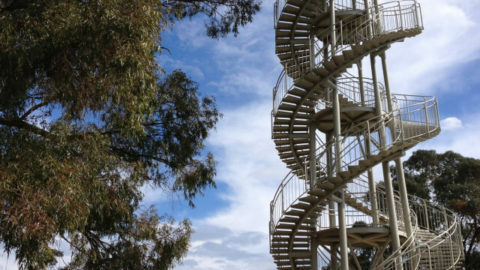 Location: Adventure World, Bibra Lake. 6. 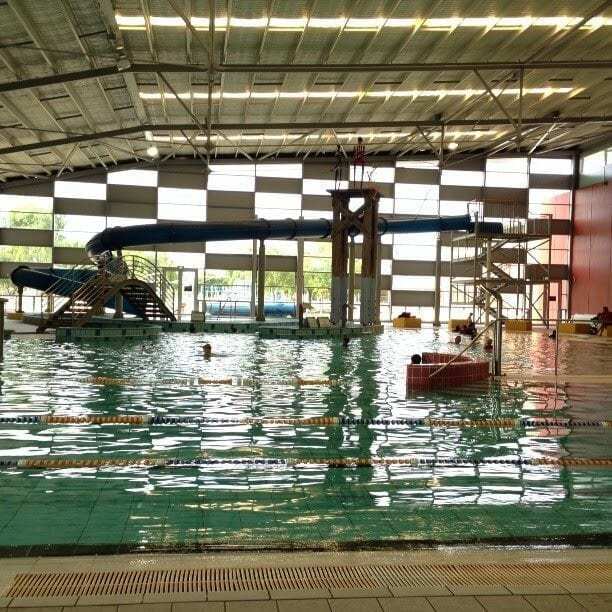 Indoor waterslide at HBF Arena Joondalup- 42 meter, fully enclosed tunnel slide. 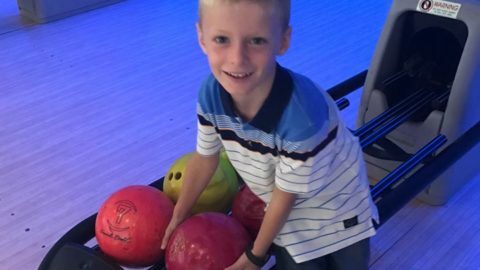 Open weekends and school holidays from 11am-4pm. 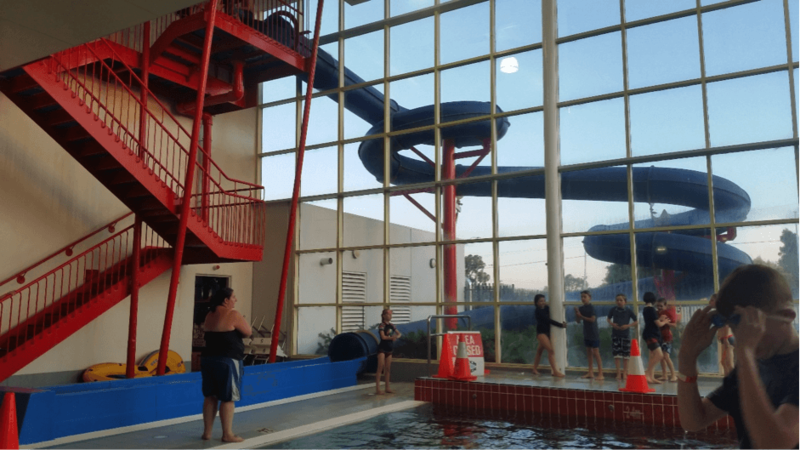 This slide boasts being one of the largest indoor waterslide in Perth. 8. Tunnel of Terror- a fully enclosed corkscrew waterslide. It’s very dark and very fast! Must be at least 110 cm to ride. Location: Adventure World, Bibra Lake. 9. 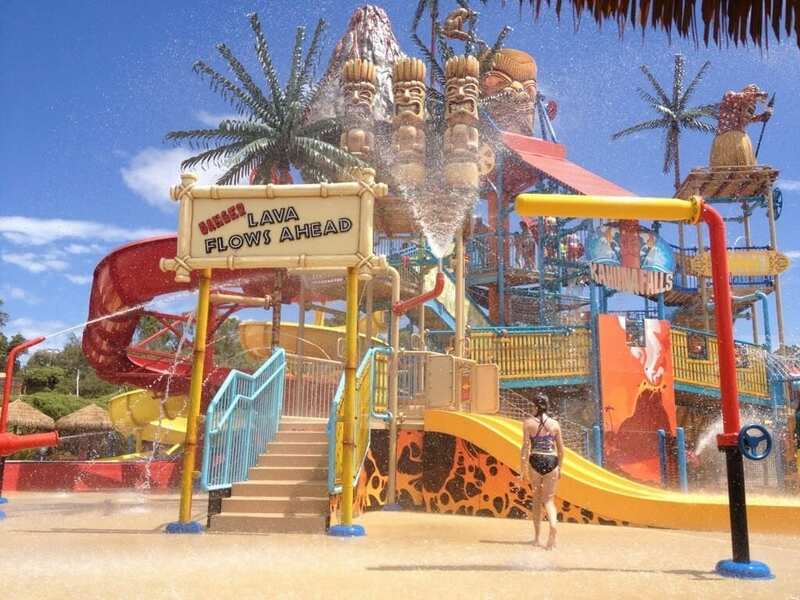 Kahuna Falls – Ride the lava tubes down the Hawaiian volcano and challenge the curse of the Tiki God, Chief Tonga Wonga at Kahuna Falls! 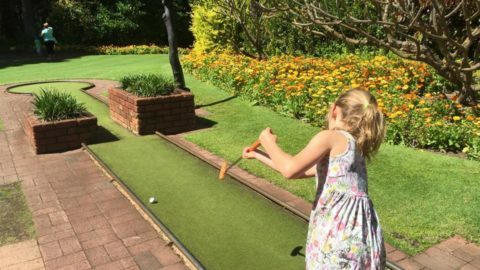 This Perth attraction has over 100 water-play features with a giant bucket that tips over 1000 litres in torrents of water every day! 10. 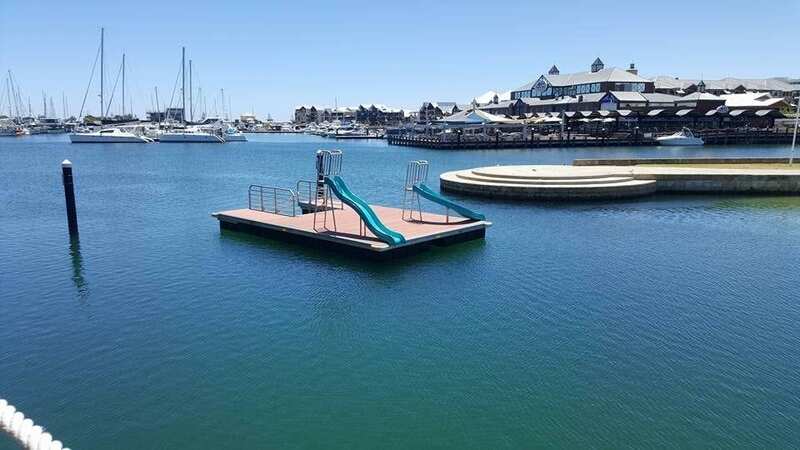 Dock Slides at Hillary’s Boat Harbour– If you are able to swim to the raft, the best part about these slides is they are free of charge! 11. Side by Side Slides at Beatty Park Leisure Centre- These slides are loads of fun, but still tame enough for swimmers 3 years plus. 12. 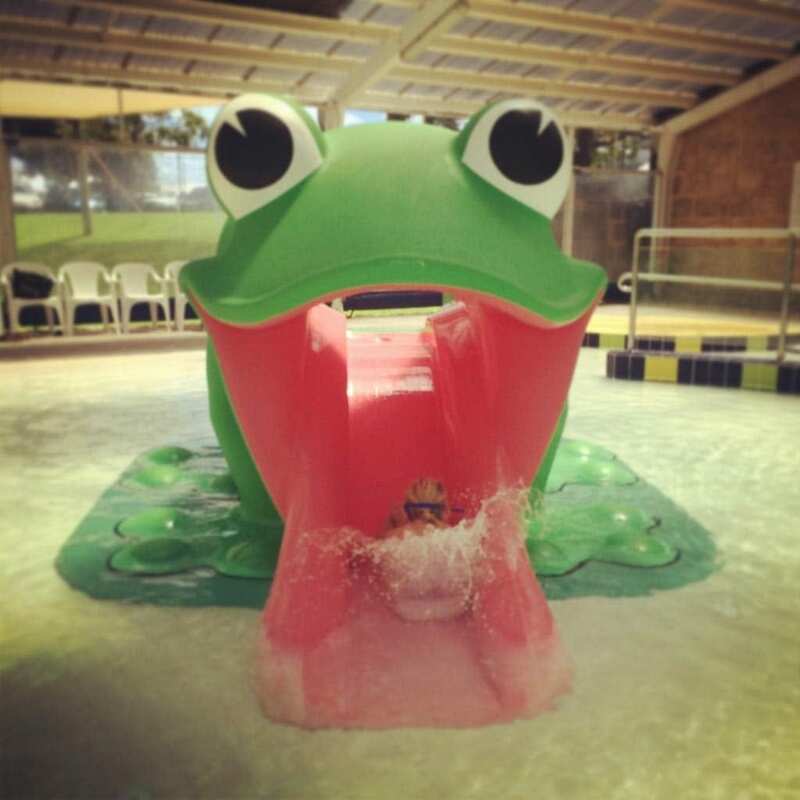 The Big Green Frog Slide- at Fremantle Aquatic Centre is a hit with the young ones. Who could resist those big eyes and wide grin? 13. 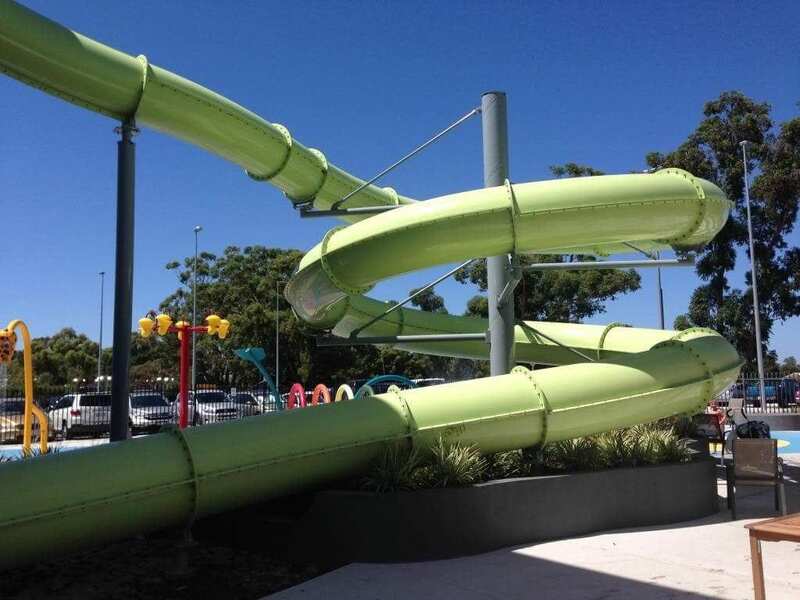 50m Thrill Slide at Riverton Leisureplex The waterslide operates weekends and school holidays only at set times during the summer and winter months. See the website for more information. Waterslide usage is not included in the general entry fee. Tickets for the waterslide are available at the cafe. For safety reasons children must be over the age of six to ride the waterslide. 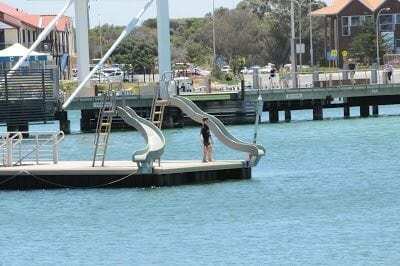 Suitable for stronger swimmers, two free water slides are located floating on a pontoon at Lido Beach in Mandurah.